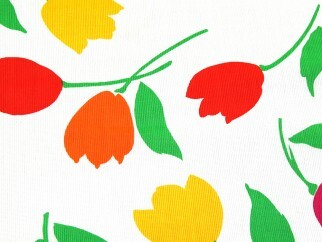 This lovely quality polyester and cotton blend dressmaking fabric has an interesting weave and soft handle. It would be ideal for sewing into tops, blouses, skirts and dresses. I bought a large amount of this fabric to make a kind of internal awning/overhead sun screen for our new covered veranda. It was just right for the job. It lets in plenty of light when closed, but cuts out the glare. Its bright and cheerful, and falls in beatiful swags. Easy to work with; I overlocked the edges to prevent fraying. Made my 6 year old grandaughter a dress from this, it wasn't my choice and I was surprised by the size of the print - I expected it to be smaller, but it has made a beautiful dress for her, the handle and drape is lovely. Frays quite a bit on curves but I liked it so much am going to buy more for a dress for myself and at the sale price will cost me about ? ?10!